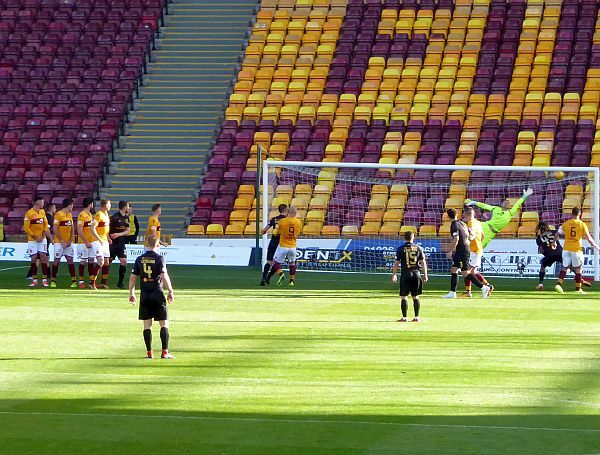 Motherwell ended a four game run of defeats with a 1-1 draw against Livingston at Fir Park. A first half Bowman goal was cancelled by a cracking free kick. In the end we were fortunate to take a point. There was nothing in this encounter to cheer the football purist. Both defences took the view that the quicker they dispatched the ball up the park the better. As the home team it might have been expected that Motherwell might have had the upper hand but we were awful. A glowing lack of confidence and fear of making a mistake was obvious. Hartley, Campbell and Rose joined the starting eleven as Taylor-Sinclair, Grimshaw and Bigirimana moved aside. The visitors had the best of the opening exchanges and it was soon evident that long ball clearances would be the order of the day from both sides. A midfield pick up by Campbell set up the 16th minute opener. Bowman collected on the left side of the area and with the help of a slight deflection off of Halkett we had the lead. None of the claret and amber fans in the crowd expected supposed that the remaining minutes would lead to a win. We had taken a similar early advantage in the last two outings at Rugby Park and at Tynecastle and managed to lose. We had Willie Collum to thank five minutes later when he Livingston forced the ball over our goal line following a corner. No infringement was obvious to those in close attendance in the Cooper Stand. We reached the break still ahead but without any suggestion that our lead might be extended. Easy wages were earned in the second half by the Livingston ‘keeper. Kelly was a spectator as his team camped in our half. There were no passes from our defence as we seemed content to launch it long, regroup and face another onslaught. Just after the hour Hartley was booked for a foul on Menga. Jacobs too the free kick from 25 yards and the ball flew beyond Carson into the postage stamp corner. It was the only class action of the game. McHugh was booked for a hefty challenge on Gallagher and ten minutes later he followed it up with a crunch on Menga. His second yellow reduced us to ten men and any hope of a win disappeared. McHugh will miss the game against St Johnstone after the international break. It is unlikely that he will be missed. In the end we were fortunate to hang on. The only positive aspect was that we gained a point over Dundee and Hamilton. Unless we show a marked improvement in the near future we will be in big trouble.